On Monday, April 22, the Lake Erie Islands Conservancy will hold an Earth Day walk at the Jane Coates Wildflower Trail at 4:00pm. 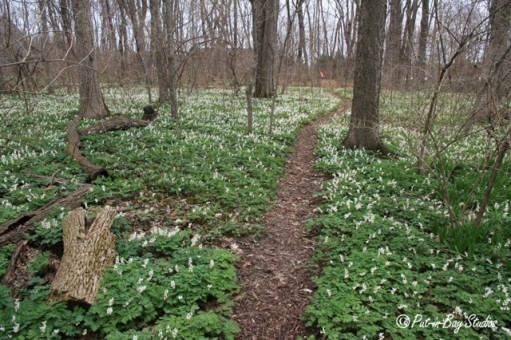 We will enjoy early spring wildflowers like Dutchman’s Breeches, cut-leaved toothwort, and false Solomon’s seal. Everyone will learn to identify the invasive garlic mustard-and pull it up! Do your part to ensure that the Dutchmans breeches continue to grow at the Wildflower Trail. Gloves, bags will be provided. Heinemans winery will provide water and LEIC will provide snacks including some made with the garlic mustard. Prizes of a free LEIC t-shirt or hat to the most garlic mustard pulled. Special nature door prizes in hidden Easter eggs as well! For those who want an earlier start, we will be at the Scheeff East Point Preserve at 2;00pm for a shoreline cleanup! Earth Day was first celebrated in 1970 and is now an annual celebration every April 22 to demonstrate support for environmental protection in over 193 countries. Celebrate Earth Day and spring with us on the islands!